The feature that I’m currently implementing for IMayBeLate.com is one that will allow you to select the stations that you use on a particular line. 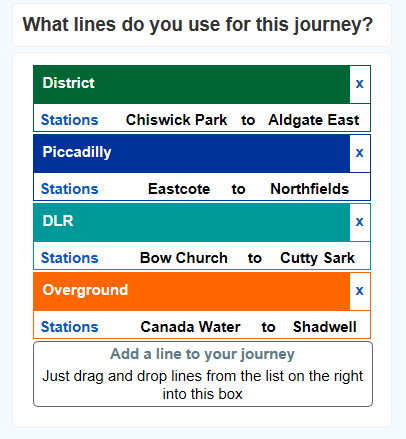 Whilst choosing the lines you commute on, you will be given the opportunity to select the stations on that line that you use. At present TFL separate their status information into lines and stations.By gathering this information, I can use the station information help provide you with information beyond just line disruptions. Sometimes stations are closed due to emergencies or, more commonly, over-crowding. This extra information might mean you’ll walk to the next station, avoid the queues! This also takes me one step closer to being able to suggest alternative routes and to provide warnings when the disruptions of other lines indirectly affect your lines. Let me know what you think of this feature by commenting below! If you’re a London commuter and not already signed up, please head to www.imaybelate.com/signup and get started! ← TFL Live Status Information; My ARSE!